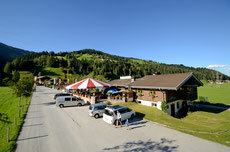 In summer the "Niederbergstüberl" offer you culinary delights. 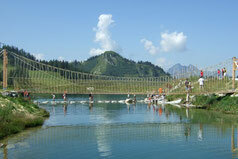 A wunderfull starting point for a nature hike and bicycle tours. A paradies in summer for children and adults too. That's fun! The mountain bike park offer not only professionals also beginners a cool mix of trail, jumps and tables. The trail "Hard Rock" with start directly on the mountain station "Flying Mozart" leads more than 3,7 kilometers downhill. Parking at the Jägersee or at the Schwabalm (toll road 4€ per car) Climb to the Tappenkarsee ( biggest mountain lake of the Eastern Alps). From Moadörfl in the direction Zollweg, know past the fish bond. 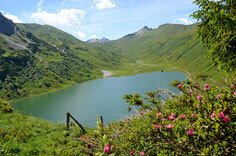 Then take the hiking trail in the direction of Schwaighof. On the Asphaltway to the local center of Schwaighof and on the cycle path back to Moadörfl.